High School goals: Gina has been on a college-preparatory track taking many honors and AP classes. Other interests/activities besides bowling? Gina is very involved in the band program at her school. As a freshman she is a member of the symphonic band, marching band, pep band, and pit orchestra. She also is a member of the drama club. What kind of college are you looking for? 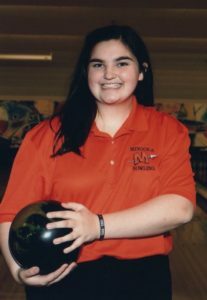 Her educational/career goals are still undecided, but Gina hopes to bowl in college. Freshman Year: average 192, high 3-game series 731, varsity team member, SPC Conference tournament (team 1st place, Gina 1st place individually with a 1403 series), SPC All-Conference, Regional Champions (individual 4th, team 1st), Sectionals qualifying team (team 4th), individual medalist at Ann Hohn 2016 Sophomore Invitational Tournament (2nd place), individual medalist at PNHS Tiger Girls F/S Bowling Invitational (8th place).